Laundry is a drudgery that no one enjoys, yet everyone must do. Given their druthers, most people would prefer to avoid the chore entirely. Luckily, a bright and cheery work space with plenty of storage and built-ins to aid in efficiency can vastly improve the situation. 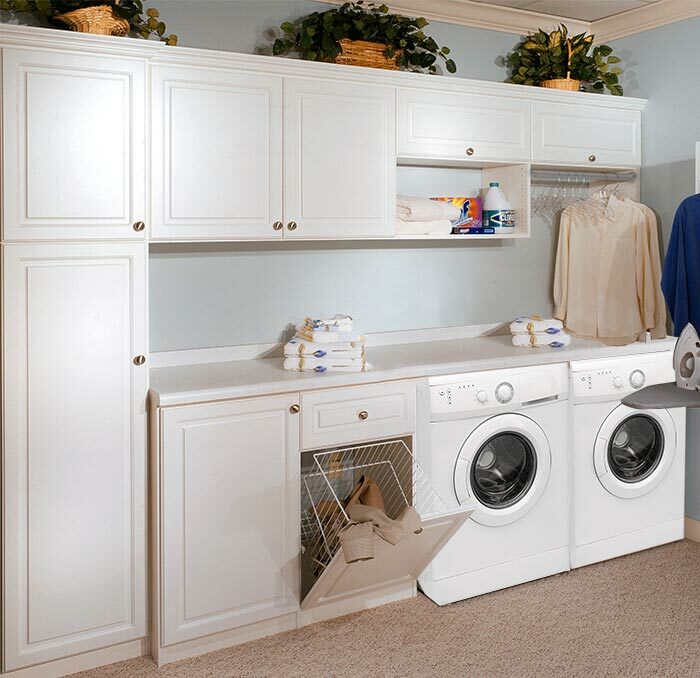 There are several places where a homeowner might typically squeeze in an in home laundry room. Closets, bathrooms, rear entries/mudrooms and even garages are all popular locations. However, the traditional, and perhaps most challenging location, is the basement laundry room. Basement laundry rooms have a reputation for being dark, damp, dingy spaces plagued by spiders. Certainly, this characterized most basement laundry areas in the past and can still be the case today. However, given the amount of time required to keep up with the average family's wash, it makes sense to remodel the basement laundry room into a bright, clean, pleasant space. 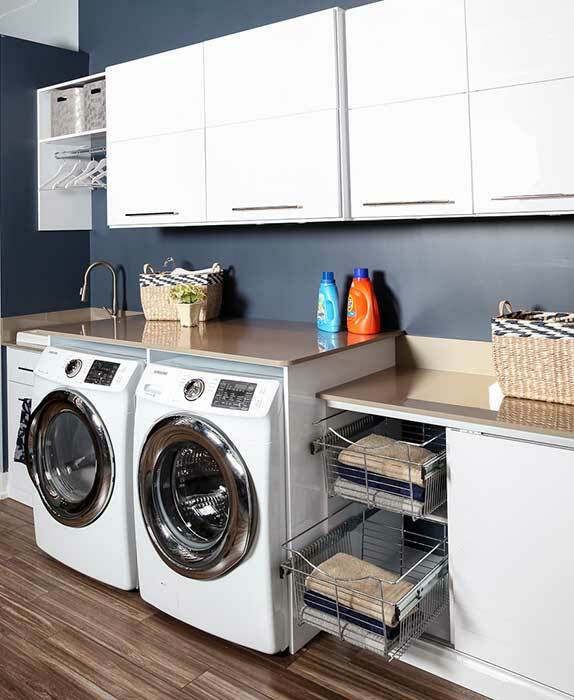 A well-designed basement laundry room makeover can even reduce the amount of time it takes to do wash through increased efficiencies. 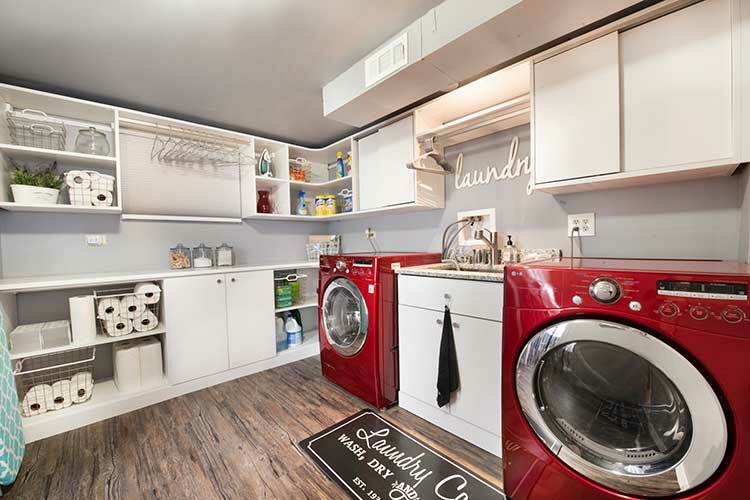 Even if your laundry room is located in an unfinished basement, a well thought out basement laundry room makeover can make the time spent doing wash pleasant, if not downright enjoyable. Closet Works recently completed makeovers for two basement laundry rooms. Each presented its own unique challenges, but there were also similarities due to the below grade location of the laundry rooms. There are specific design principles that can overcome the typical basement obstacles. Problems such as uneven floors and walls, pipes and ductwork that obstruct access, lack of light, and excess moisture can be overcome through good storage design, leading to bright and cheery basement laundry room spaces. CASE STUDY: The clients live in an older home with a laundry area in the basement. This space was equipped with a standard utility sink and a washer and dryer, but the customer wanted better storage and a nicer look to the area. We concentrated on creating a bright and cheery space with abundant shelving and cabinets for storage. A long countertop wraps the biggest wall, providing needed space for folding and organizing clothing. The old utility sink was replaced by a new sink with custom cabinet. We stuck with a simple white and gray pallet that made the client's red appliances pop, focusing attention on that bright and happy color. Challenges for this project included working in a basement with low ceilings and lots of exposed ductwork. Large air vents for the home's HVAC system were hanging from the ceiling, restricting access to some of the walls. We optimized the space and worked around the ductwork in the ceiling by using sliding doors on the cabinets above the appliances. Standard doors would not have been able to open without hitting the ducts. Stick to a simple color palette. When working with a basement laundry room space, choose light colors — white works especially well — for your cabinetry to reflect the most ambient illumination. Pick a few vivid colors to use in small doses as accent colors. This can be achieved through the use of appliances in the bright color, and/or through the addition of accessories like brightly colored hangers. If you are at a loss as to which colors to focus on, think about the colors used for your children's toys. These colors will evoke a happy emotional response in most people, plus they work well with white. Include as much countertop space as your room will allow. You can never have too much area for folding clothes and staging your laundry. 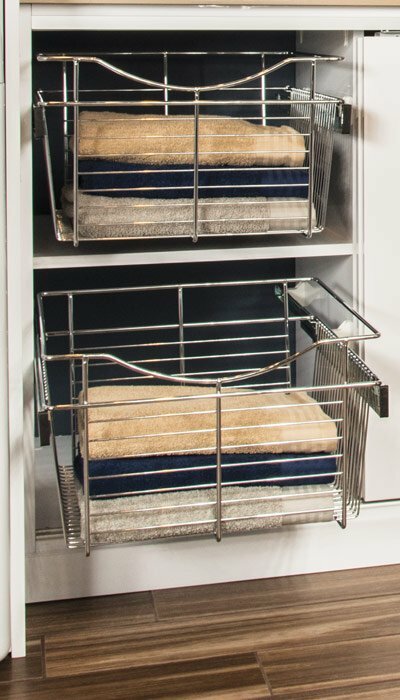 Make sure that you have cabinets or shelves that are deep enough to store your laundry baskets. This will make the sorting process easier and more efficient, in addition to keeping the room neat and organized. Pull-out wire baskets are especially efficient. They allow multiple sorting baskets to stack on top of each other while retaining the ability to access and pull out individual baskets as needed. Use a flooring material that can withstand some water. Vinyl, ceramic tile and polished or epoxy coated floors works well for basement laundries. Wood and laminates are a poor choice for below grade spaces. If moisture is a concern due to seepage or flooding, either suspend storage cabinets from the wall, or use garage legs to raise cabinetry off the floor. The legs can always be covered by a strip of base moulding. You will be grateful to the protection against water damage that they provide. Include adjustable legs under your cabinets. Basement floors are bound to be uneven and are often pitched towards a central floor drain. Just as your washer and dryer come with adjustable legs, so should your cabinetry. Better than shims in a basement situation, they will help keep everything level. Use sliding doors on your cabinets. Basements are notorious for featuring overhead ductwork and pipes that crisscrosses the ceiling — usually where you least want them. They generally hang low and can block traditional cabinet doors from being able to swing out and open completely. By choosing sliding cabinet doors, you avoid any problems with the ducts and pipes. Include a clothes rod located near a sink for your drip-dry items. Lingerie and swimsuits last longer when allowed to air dry, as do many sweaters. One benefit to having your laundry room in the basement is that you can unabashedly hang up personal items, like underwear, without any loss of the privacy you might experience if your laundry room is located next to a rear entrance to the home frequented by neighbors and friends. 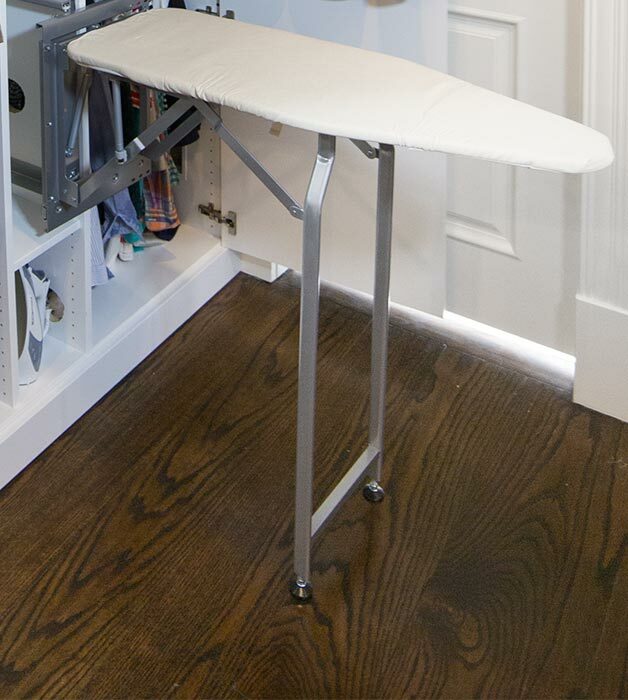 You may as well take advantage of the more private location of your laundry by including a clothes rod in your storage design. 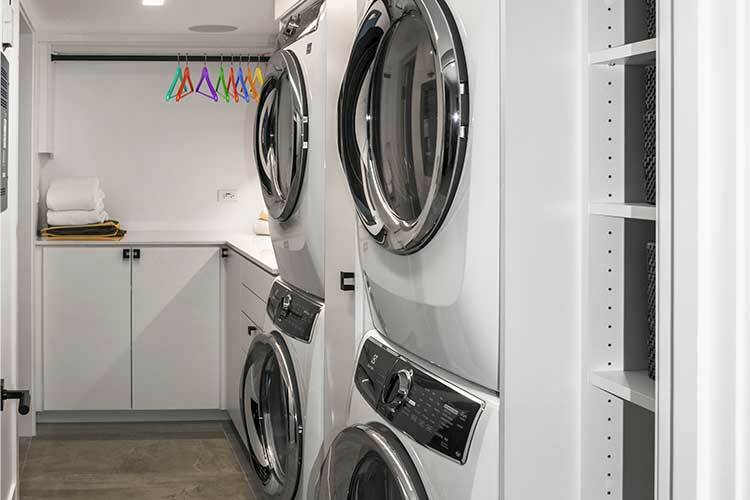 Basement laundry rooms have fallen out of favor in new homes as more and more homeowners request to have their laundry areas located near to where the laundry is created — either near the bedrooms or next to the mudroom. Older homes, however, were not built with this preference in mind. Sacrificing needed living space for a new, above-ground laundry room is often not feasible. Many laundry rooms in older houses are thereby sentenced to remain in the basement. This is not necessarily bad. 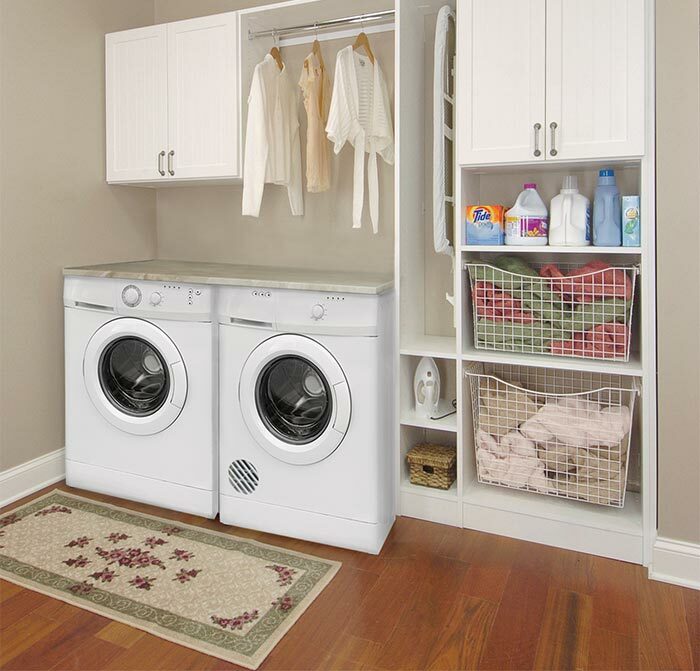 Properly designed basement laundry rooms can be both bright, cheery, practical, and a definite asset to the home. Basement laundry room makeovers that include a simple color pallette comprised of white or similar light hue with a couple of bright accent colors, plenty of countertop space, deep cabinets or shelves for baskets, a water resistant flooring material, cabinets that have been designed to resist seepage and include leg levelers, sliding cabinet doors and a clothes rod for drip-dry items are bound to be successful. 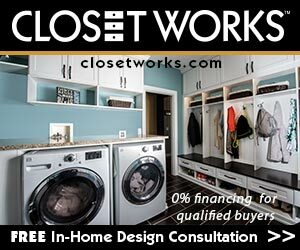 Closet Works is Chicagoland's largest and most experienced provider of custom storage solutions. Since 1987, we have been helping homeowners by creating closets, pantries, laundry rooms, office/guest rooms, wall units and more that help create a better, less stressful lifestyle. All of our organization systems are made locally at our factory in Elmhurst IL. USA. Great ideas to "Organize Your Life" and examples of our organized bedrooms, closets, garages and other custom organization systems can be found throughout our website. For more information on Closet Works call toll-free at 800-4-CLOSET (800-425-6738).